Retailers continue to expand their geographic footprint, the diversity of formats, and the breadth of their product/service offerings in order to grow and compete. The increasing level of complexity highlights the critical role and challenge of corporate strategy. For leading retailers, corporate strategy identifies a set of actionable decisions that leverage the scale of the enterprise and, enables its divisions and functions to effectively win in the marketplace. To harness the capability of their organizations retailers are refocusing on developing corporate strategies that include an aspirational vision. 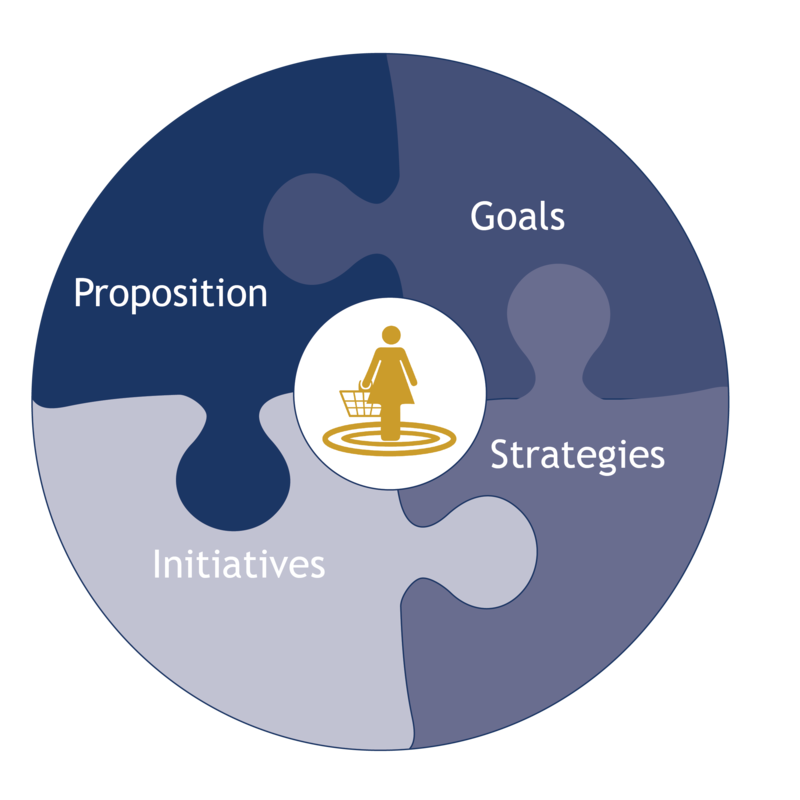 They align their vision with clear and concise strategies and performance targets. When properly designed and deployed, corporate strategy resides in the hearts, and minds of day-to-day activities for every employee. Competitor Landscape Analysis: TPG provides a comprehensive in-depth analysis of the market as well as the competitive landscape, the entire value chain, relevant retail best practices and the current state of the retailer’s culture. This goes far beyond the typical SWOT analysis into positioning maps for the retailer/division and its competitors. Target Shopper: Using new or existing research and internal customer data, TPG and the executive team develop a clear, achievable and growth centric target shopper profile. This is defining of the retailer’s strategy going forward. Differentiating Proposition: Research and analysis to determine the differentiated product/service offering, shopping experience and price positioning. TPG leverages strategic analysis to determine the strongest, most “ownable”, differentiating proposition across a mix of tactics and positioning across a retail map or landscape. And, how to deliver our proposition and create corporate value. Performance Goals: A balanced set of financial and non-financial metrics and targets integrated with the corporate scorecard. Operating Strategies & Initiatives: A focused set of strategies and initiatives encompassing but not limited to merchandising, marketing, retail operations, logistics and talent development. Culture “Stress Test”: Evaluation of the organization’s capability and willingness to absorb the corporate strategy, revealing any inherent risks and necessary contingency plans. Robust Strategic Planning and Refresh Model: A repeatable strategic planning model and approach that enables self-sufficiency for the retailer.